Tisdale on the problems with ENSO models | Watts Up With That? The preliminary Reynolds OI.v2 sea surface temperature data for July 2012 won’t be available until next Monday July 30th, and there haven’t been any changes in weekly NINO3.4 region or global sea surface temperature anomalies since the update last week that are worth a separate post. So I’ve decided to give readers a heads-up about a paper I’m using as a primary reference for Chapter 5.8 Scientific Studies of the IPCC’s Climate Models Reveal How Poorly the Models Simulate ENSO Processes of my upcoming book Who Turned On The Heat? : El Niño-Southern Oscillation, the Unsuspected Global Warming Culprit. The paper is Guilyardi et al (2009) Understanding El Niño in Ocean-Atmosphere General Circulation Models: progress and challenges. It is basically an overview of the many problems experienced by climate models in their attempts to simulate ENSO, and as such they cite more than 100 other papers. Many of the cited papers discuss individual climate model problems, while others look at many models, while still other papers are detailed discussions of ENSO processes. If you’re not extremely familiar with ENSO, some of the topics may be overly technical. On the other hand, some of the problems discussed may even seem nitpicky, but Guilyardi et al do explain why these model errors are, in fact, problems. The “sidebar” discussions, highlighted in burnt orange, are about how wellpoorly climate models capture the mean state and annual cycle of the tropical Pacific. The models have such severe problems with their portrayal of the mean state and annual cycle that you’re left asking yourself one question: With all of those problems, how could the modelers think that the El Niño and La Niña events they place atop the mean state have any chance at capturing reality? During their discussion of the model portrayal of El Niño and La Niña events, Guilyardi et al (2009) use the term “skewness”. With skewness, they’re referring to the fact that since 1976, El Niño events have been stronger than La Niña events. ENSO has been skewed toward the El Niño phase. But as Guilyardi et al (2009) discuss, they’re not in the climate models. Modeled La Niña events tend to be the same strength as El Niño events. Let’s take that further. If the models also produce the same number of La Niña events as El Niño events, then modeled ENSO would become a nonentity. Is this the reason why models show the equatorial Pacific warming nearly as fast as, or faster than, the mid latitudes, depending on model vintage? (See Figure 1, which is Figure 5-37 from my upcoming book.) When in reality, the equatorial Pacific has cooled over the past 30 years, while the mid latitudes have warmed. This indicates to me that in the real world, ENSO-related processes are distributing warm water from the tropics toward the mid latitudes in the Pacific—something that’s not captured by the models. And that’s a big problem. A clarification: Guilyardi et al (2009) “Understanding El Niño in Ocean-Atmosphere General Circulation Models: progress and challenges” is about how climate models portray ENSO, not about models used to predict ENSO. Is the failure one of not representing dynamics correctly on the interannual time scale, such as certain modes of surface waves? The entire sea surface temperature record displays an asymmetry (skewness) of the distribution of ENSO event magnitudes. With skewness, they’re referring to the fact that since 1976, for example, El Niño events have been stronger than La Niña events, and it can change over decadal periods, with La Niña becoming stronger than El Niño at times. I’ll update the cross post at my blog. Thanks for the link to Douglass 2009. Bob, if you are going to reference the Douglass paper then I’d phrase it like this. Douglass 2009 showed that the magnitude of El Nino events conform to a skewed gaussian (also called normal) distribution, with more stronger El Nino events than La Nina events. Since 1976 we have seen several of these stronger (larger magnitude) El Nino events, including 1998. If El Nino event magnitudes continue their skewed gaussian distribution, we should expect a return to a period when the magnitude of El Nino and La Nino events are more equal. And, a quick look at Guilyardi et al (2009). I’d say they are definitely referring to model predictions and predictive models of ENSO. The definition of an El Nino slightly differs among reserchers. Using the consensus definition listed at http://ggweather.com/enso/years.htm, Since 1977,when the PDO was in its recent warm phase between 1977 and 1998 there were 7 El Nino consensus events and just 1 La Nina. Between the late 1940’s and 1976 the PDO was negative and from 1950 to 1976 when global averages cooled, there were 9 La Ninas and only 3 El Ninos. As the PDO has now reversed trending toward a more negative cool phase, from 1998 to 2012 El Ninos have equaled La Ninas suggesting we should enter a period of less El Ninos. El Ninos are periods of ventilating ocean heat while La Nina is absorbing heat. Although a single El Nino can’t cause a warming trend, an increase in El Nnos relative to La Nina would certainly create that illusion. Douglass 2009 showed that the magnitude of ENSO events conform to a skewed gaussian (also called normal) distribution, with more stronger El Nino events than La Nina events. Since 1976 we have seen several of these stronger (larger magnitude) El Nino events, including 1998. If ENSO event magnitudes continue their skewed gaussian distribution, we should expect a return to a period when the magnitude of El Nino and La Nino events are more equal. As anybody can read: North America only. Power et al. 2006 deals with ENSO effects on the Australian climate. Both papers do not mention that ENSO is responsible for the warming on both continents. The papers simply claim that ENSO has impacts on wet/dry or hot/cold conditions over decadal timscales. Unlike Mr. Tisdale who thinks that ENSO is responsible for global warming the two papers are not even remotely implying this. Where is the evidence for this bold claim? Please show us the satellite imagery or something else. Science please and not conjecture. Robbie: You picked a few of the Guilyardi et al references and concluded that they did not agree with my findings that ENSO is responsible for the long-term trend in sea surface temperatures since 1982 . Was this post about the long-term impacts of ENSO on sea surface temperatures, Robbie? No, it was not. It was about how poorly climate models simulated ENSO. I provided a link to a paper, Guilyardi et al (2009), that discussed how poorly climate models simulate ENSO and you find a few papers in the references that discuss North America and Australian LAND surface temperature teleconnections and somehow conclude that they don’t support my findings. That has got to be the most ridiculous conclusion you have come up with to date. Based on your representations, both papers were about how well models simulated teleconnections, Robbie. In effect, you stated they were NOT about the long-term effects of ENSO on sea surface temperatures, yet in some bizarre way, this led you to the conclusion that my findings were wrong about the long-term effects of ENSO on sea surface temperatures. You’re wasting your time and mine with nonsense like that, Robbie. You either misunderstand the subject matter, or you’ve made a bad effort at misdirection, or both. My guess is both. The evidence is the graph, Robbie. Look at the graph. Try to understand what it shows. 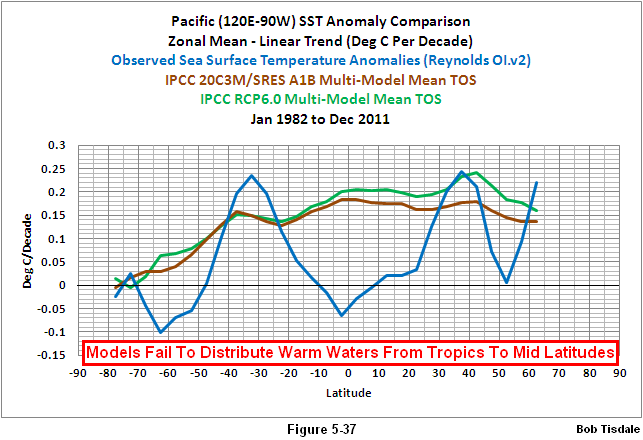 It very clearly indicates that the models have no skill at simulating the patterns of how the Pacific Ocean has warmed on a zonal mean (latitudinal) basis over the past 30 years. Also look at the observations-based data, Robbie. Notice how the mid-latitudes have warmed while the equatorial Pacific has cooled. Why hasn’t the Pacific Ocean warmed as the models say it should have due to greenhouse gases? The models say the equatorial and tropical Pacific should have warmed on the order of 0.4 deg C to 0.6 deg C over the past 30 years. But the equatorial Pacific has cooled. Why is that, Robbie, if some process is not redistributing warm water from the tropics to mid latitudes? Do you know of any process other than ENSO in the Pacific Ocean that could redistribute warm water like that, Robbie? As I wrote above, you’re wasting your time and mine. Semi-interesting chart that could help the modelers. A scattergram of the Nino 3.4 index by the month going back to 1871. Nino 3.4 peaks in December/January with the variance being +3.4C/-2.4C. May, June July are closer to neutral at +1.8C/-1.7C. But every single month has an average over time of ZERO. It is a plus/minus oscillation with no trend over time but it does have a seasonal peak/bottom pattern. Bill Illis-Interesting, that there is more variability in ENSO in the Northern Hemisphere winter months. This is not quite what I would expect, given that the seasonal cycle in the ENSO region is so different from areas further from the equator and on land (specifically, temperatures peak around April and bottom out around August) but I have noticed that winter temperatures, at least in Northern Hemisphere locations, are more variable than summer. Perhaps some of that is an ENSO effect? Are summer temperatures highly variable in the Southern Hemisphere? For background info, see the work of NASA JPL’s Jean Dickey. Dickey & Keppenne reported that in 1997 (without calling it solar). LeMouel, Blanter, Shnirman, & Courtillot showed the same thing in 2010. All I’ve done is present the result in a different format. Everyone needs to learn to do the calculations independently. Dozens of methods all give the same result. Can it get much clearer than that? The title of your book clearly says that ENSO is the driver of climate which is not. You should not have included it in this piece if you only wanted to talk about the inconsistencies of models. Please take a good look at the quotation you chose to pick and include in your blog. In there you will find the two references I picked. I didn’t pick them. You did. In other words: ENSO may well be a phenomenon that has not always been around in the Pacific. On one thing I do agree with you and Guilyardi et al (2009). Climate models do not do a good job. That’s why I try to disregard models as much as possible. Maybe now you understand my earlier comment better. Please take a good look at this picture and maybe you will be able to figure out why ocean temperatures have warmed at 30-40 and -30-40 deg lattitudes. It also explains the trough at 50 deg North. Climate change could be responsible for the warming of ocean water at higher lattitudes and not what you are claiming. Your graph doesn’t prove your claim at all. You need to prove with satellite imagery or something else that indeed the warm water from El Niño events are warming the higher lattitudes on a longer timescale. And for the tropical cooling it could be more cold water upwelling because of the extensive El Niño period the Pacific experienced during 1982-2011. Try to make a similar blue graph from the period 1945-1975 and it will probably result in a warmer tropical anomaly than usual. But Reynolds wasn’t probably around back then, was it? It’s a little bit more complicated than you would like it to be and far too early to draw the conclusion that it was ENSO responsible for the redistribution of warm water to higher lattitudes. Robbie: You continue to waste your time and mine. You must be very bored. I’m not. So let’s get down to brass tacks with hope that you’ll find a new direction. Robbie says: “Please take a good look at this picture and maybe you will be able to figure out why ocean temperatures have warmed at 30-40 and -30-40 deg lattitudes. It also explains the trough at 50 deg North. Robbie, I understand ocean currents and gyres. Are you aware that I’ve discussed in my posts the Western Boundary Currents and their extensions, like the Kuroshio-Oyashio Extension (KOE) in the northwest Pacific? I have illustrated, animated, plotted data and explained why the Pacific western boundary extensions warm in response to El Nino events in numerous posts. Anthony Watts has cross posted over 100 of my posts here at WUWT. It’s a tough crowd here. They’re skeptics, you know. It’s been a wonderful way to refine my findings. In other words, I have more than a basic understanding of the subject. All of your concerns have been answered. Maybe YOU should study the subject so that YOU can identify the currents and the ENSO-related processes instead of providing a map and saying: here, this explains it. In my last reply, I asked you to explain why the climate models don’t simulate the patterns of warming as they exist in the Pacific for the past 30 years. You provided a link to a map of ocean currents? I asked you to explain, with a process other than ENSO, why the equatorial Pacific has cooled over the past 30 years, and you used ENSO in your explanation. That’s a head scratcher. The rest of your comments on this thread are focused on the fact that there are no climate model-based studies that support my findings. Everyone understands that, Robbie. So you’re wasting your time. Your persistence illustrates your inability to grasp that. Can your beloved climate models explain why the East Pacific Ocean from pole to pole (90S-90N, 180-80W), which represents 33% of the surface area of the global oceans, hasn’t warmed in 30 years? No, they can’t. According to the climate models, the East Pacific Ocean should have warmed 0.42 deg C to 0.45 deg C, but it hasn’t warmed at all. Why is that, Robbie? Can you explain, without the use of ENSO-related processes, why the East Pacific ocean hasn’t warmed in response to the rise in greenhouse gases? With respect to your request that I show the zonal mean trends for the Pacific During an earlier (not-satellite-based) period, I will suggest that you do your own research. I certainly am NOT going to do it for you. You crossed the line with me a long time ago. I will suggest that you also study where sea surface temperature source data (ICOADS) is available before you come back with your results. That way you’ll understand where there’s real data and where there’s infilled data. And I will strongly suggest, since peer review is so important to you, that you determine which of the long-term sea surface temperature reconstructions are peer-reviewed and which one isn’t. Wouldn’t want you to waste your time downloading data and plotting it, only to find you’ve presented data from a dataset that’s not based on a peer-reviewed paper. And yes, there is one. Your failure to grasp the importance of the findings of Guilyardi et al (2009) is highlighted by your quoting Foster et al (2010) in a recent comment on this thread. Your very limited understanding of the subject matter is illustrated by your inability to discuss the current map you linked. (Here’s a map, Bob, this explains it.) All you are doing here is broadcasting the shortcomings of your arguments. You pick little snippets of papers, the parts you understand. It’s really poor form on your part. Everyone reading this thread can see it. Robbie, you came in here as an adversary a couple of months ago. On this thread, you marched in and told me that I haven’t done the research to support my claims. And you continue to do so. Did you think to ask whether I had? If you asked me if I had published posts or comments that explained why the mid-latitudes of the Pacific warm in response to ENSO, I would have been happy to provide you links. I may even have written an explanation just for you, in response to the phrasing of your question, as I often do here at WUWT and at my blog. (The phrasing of the question gives me an idea of the level of understanding of the person asking the question.) But you didn’t ask. You told me I haven’t done the research, when in fact I have. YOU chose an adversarial relationship—but you have no understanding of the subject. Not a good idea. People reading this thread can see it. They know you’re blowing smoke. They are gateways to a multitude of datasets. So that you can get a grasp of ENSO, study the ENSO-related datasets: sea surface temperature, precipitation, cloud cover, ocean heat content, thermocline depth, warm water volume, depth-averaged temperature, downward shortwave radiation, trade wind strength and direction, ocean currents, etc. Then divide the global oceans into subsets as I have and explain your findings. In three years when you’ve got a reasonable grasp of ENSO and how and why those subsets warm—or don’t warm—come back with your findings. I’ll be happy to discuss them with you then. Until that time, you’re on your own. In other words, I’ve done my homework, but you haven’t done yours. Come back when you’ve done it. Wait a moment Mr. Tisdale. What models tell us and what reality tells us. Those are two different things. Comparing apples with oranges. And you ask me for an explanation for it. Instead you keep on going questioning me about the models on which I admit that they do not do a good job. The fact for a tropical cooling because of ENSO has been known for several years. Text beneath the title: El Niño: Cooling for the tropics? That was 1997/1998. The process of a cooling of the equatorial Pacific because of increased ENSO activity has been known for a long time and is no big news. or global sea surface temperatures going up as well. That’s 67% of the world’s oceans. But most importantly you forget to address the basic point of the discussion. You claim that ENSO is driving climate change on the longer term which is not and I haven’t seen you giving any evidence for it so far. Not a link or a source. The scientific community has rejected that hypothesis long time ago, because there is simply no evidence for it. Instead you keep on going to question me the validity of models on which I agree with you. Just show us the mechanism how ENSO is capable of warming up the globe for longer periods of time with fundamental evidence. 30 years of data simply isn’t enough to proof that. You need much longer timescales. Your graph (blue line) shows anomalies, but does not prove that it was warm water displacement which caused the higher lattitudes to warm. It is still a bold conclusion. Could be all sorts of explanations for that. I have given you just one and it apparently bothers you a great deal. I came here as a skeptic and skeptics ask annoying questions. The answer you gave so far is all about me having no understanding of the matter or me showing disrespect. All personal attacks while I was just trying to discuss science here. Anybody can read that in this thread. Again, Robbie, you waltz in here claiming I haven’t done my homework, that I haven’t shown cause and effect, without bothering to check to see if I have. You, on the other hand, still have shown no evidence of even a basic understanding of the subject matter. Because you came in here as an adversary, telling me incorrectly what I haven’t done, you’re on your own. You’ll get no help from me. Visit my website and use the search function. Try searching for “ENSO” or “long-term”. You’ll find lots of discussions, lots of illustrations, lots of animations, lots of links. But keep in mind when you’re visiting my website that you were close to being banned as a commenter the last time you were there. If you were to repeat there what you’ve done here, you’d find your comments permanently rejected. Who’s us? The only one asking is you. Everyone else here knows I’ve been showing the mechanism for the past 3 years. Everyone visiting here has watched me repeatedly confirm my findings. Try the search function here at WUWT using my last name. Scroll all the way through to the first posts in January 1999 and then work your way forward in time. I really don’t care whether you personally are not satisfied with 30 years, Robbie. But let me explain very clearly to you why I am satisfied. According to the IPCC, only greenhouse gases could have caused the warming of global surface temperatures over the past 30 years, and I’ve clearly shown that ENSO is the primary cause of the sea surface temperature warming during period. And, I’ve shown that there is no evidence that greenhouse gases have impacted ENSO in any way. Again, Robbie, if you had asked questions as anyone interested in learning would do, I would have been happy to answer and to share information and insights. Instead, you came in with an attitude, telling me I don’t know what I’m talking about. And you continue to provide links that display you have no understanding of what we’re discussing. I’m not sure why this comes as a surprise to you, but let me clarify this point: I haven’t the slightest interest in helping you. None at all. I understand we may have a language barrier so let me repeat and reinforce a point I tried to make earlier. All of the visitors here know that there are no scientific studies that agree with my findings, which are that ENSO is the primary cause of the warming of global sea surface temperatures for the past 30 years. And all of the visitors here know why there are no studies like that; any paper that came to the same conclusions that I’ve reached would never get past the CO2-based mindset of peer reviewers who are attempting to maintain the illusion of anthropogenic global warming. What all of the visitors here do not understand is why you insist on pointing out that there are no scientific studies that agree with my findings, when they’ve understood that all along. If you continue to waste your time by rewording the same comments over and over again, I’ll simply cut and paste this reply to you in response. Do yourself a favor. The next time you have questions for the author of a blog post don’t tell the author that he or she doesn’t know what they’re talking about and then expect them to be cooperative with you. Ask your questions. It’s too late with me. See you in three years, Robbie. Figures 1 and 4 of this paper are suggestive of an oscillation in the prevalence and magnitude of el Nino events. This is consistent with the model proposed by Bob Tisdale of alternating periods of el Nino and La Nina prevalence, corresponding to the positive and negative phases of the PDO (the PDO being an epiphenomenon of ENSO). Which bear superficial resemblance to the ENSO index history plot. Anyone trying to model ENSO must have some handle on the underlying mechanism, otherwise it will be a task of endless fiddling and fudging with no connection to reality. Very fine paper. I note at line 789, it is suggested that BEST apply the new classification rules to their stations outside the US. I didn’t know about the new rules, but I did suggest to Elizabeth Muller that BEST undertake something like the surface stations project. Here is our email correspondence. 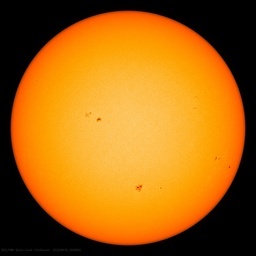 Having read over your methdology, I believe you are missing a crucial element–on-site awareness of the station attributes (does it meet NOAA criteria), and even more difficult, knowledge of the history of the station, its relocations if any, population change of the nearest town, and so on. I recognize this is a tall order for 38000 stations around the world. However, interest in this topic is at such a high point that perhaps you could multiply your efforts by a factor of thousands, as was done by Anthony Watts in the Surface Stations project. That effort, as you know, resulted in photographic proof that something like 90% of the U.S. stations were sited in non-accordance with the written criteria. It is a mystery to me that NOAA/NASA did not immediately begin to set up stations that do meet the criteria. (Or possibly they are doing something in a small way now). Would it not be possible for you to provide your list of 38000 station locations and call for volunteers to investigate those closest to their homes? This would unleash a tremendous creative and energetic potential from all those who feel somewhat helpless now. Thank you very much for your inquiry. We met with Anthony Watts several weeks ago, and will be working with him and using his data regarding the US station attributes to compare stations that do and do not meet the criteria. I think a similar effort around the world would be very interesting, and we will provide the list of our station locations when we release our data (which should be within a few months). Like you, we would love to see the results of such a global effort. Thank you for responding to my suggestion. I am, of course, pleased that you would view a global “Surface Stations” effort favorably. However, I am also disappointed that the BEST team appears not be grasping the nettle. Surely the time to look at the quality of the stations is before, or at least as nearly as possible simultaneously with, the release of the results. The best group to undertake this effort is precisely yourselves! You have raised hopes in those who view the present temperature measurements as flawed. I think you could harness the energy of hundreds of persons worldwide to look at the quality of the stations. It would be a cruel letdown if your approach suffers from the same reliance on poor quality stations as the present system. Is there any reason why you could not release the list of station locations now rather than waiting until the data has been analyzed? If the release were accompanied with a request for help in understanding the history of the stations, I see no real down side, and the possibility of an outpouring of effort to help us understand your results. All of the data we are using is already available on the web, but from many different sources and using different formats. It is an enormous amount of work putting the data in a format that other people can easily access and use, which is what we’ve been doing. This is not a trivial task and we are working as quickly as we can. We will make the full data set available to the public as soon as possible; we ourselves have not yet analyzed the full 100% sample. It appears that my fear of a “cruel letdown” was unfortunately correct.